The opinions voiced in this material are for general information only and are not intended to provide specific advice or recommendations for any individual. To determine which investment(s) may be appropriate for you, consult your financial advisor prior to investing. All performance referenced is historical and is no guarantee of future results. Any economic forecasts set forth in the presentation may not develop as predicted. Investing involves risk including loss of principal. All indexes are unmanaged and cannot be invested into directly. Unmanaged index returns do not reflect fees, expenses, or sales charges. Index performance is not indicative of the performance of any investment. All information is believed to be from reliable sources; however, LPL Financial makes no representation as to its completeness or accuracy. 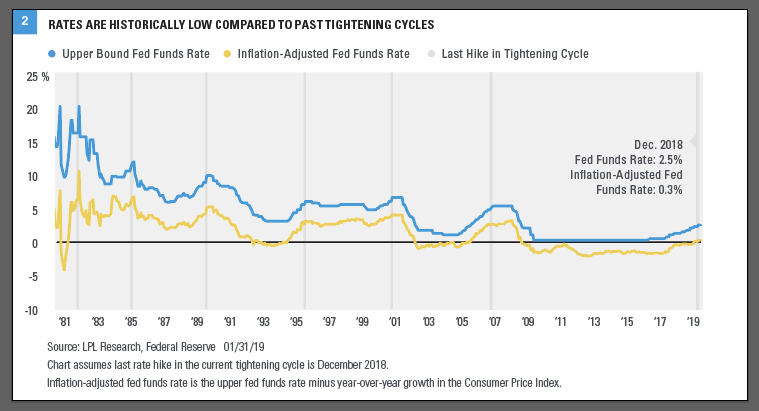 Chart assumes last rate hike in the current tightening cycle is December 2018. Inflation-adjusted fed funds rate is the upper fed funds rate minus year-over-year growth in the Consumer Price Index.